When time is of the essence, or your processes need modifications, look to Industrial Hardfacing, Inc. as your one stop shop for all your process equipment needs. Field Service available upon request. • Industrial Hardfacing, Inc. manufactures complete new machines. Industrial Hardfacing, Inc. rebuilds and manufactures many new parts for your size reduction equipment. All equipment is disassembled and given a complete and thorough inspection. We then report to you for approval prior to performing any work. IHI wants you to know exactly what is needed to bring your equipment back to the performance of when it was new. *IHI offers FREE freight when picked up and delivered by IHI trucks. IHI manufactures new spare rotating assemblies for your size reduction equipment. IHI can bring in your complete size reduction unit, and rebuild it. With nearly 50 years in the Rendering, Packing, Vegetable Oil, Pet Food, and Recycling industries—if you have a problem, we have the answers. Industrial Hardfacing is capable of rebuilding and repairing all Svaertek Equipment. Contact us today to find out how we can improve the overall performance of your existing Svaertek units. All equipment is disassembled and given a complete and thorough inspection. We then report to you for approval prior to performing any work. IHI wants you to know exactly what is needed to bring your equipment back to the performance of when it was new. IHI Industrial Hardfacing has extensive experience rebuilding and manufacturing replacement parts for most DUPPS manufactured Size Reduction Equipment. Why IHI is the right choice for your equipment rebuild needs? Industrial Hardfacing, Inc. has been a service leader to the Rendering, Packing, Vegetable Oil, Pet Food, and Recycling industries for nearly 50 years. We primarily rebuild and manufacture new wear parts for mechanical pressing, grinding, shredding, extruding and expanding equipment. Our goal as a company is to remain and excel as an industry leader and provide dependable service and quality products to assist our customers to do their jobs more effectively and profitably. With continuing efforts to make advancements in technologies and metal alloys, Industrial Hardfacing is the right choice for all your equipment requirements. Every step of the way IHI experts can help you and your team identify the best solution. Contact us today to explore if rebuilding or purchasing new IHI Size Reduction Equipment makes the most sense. 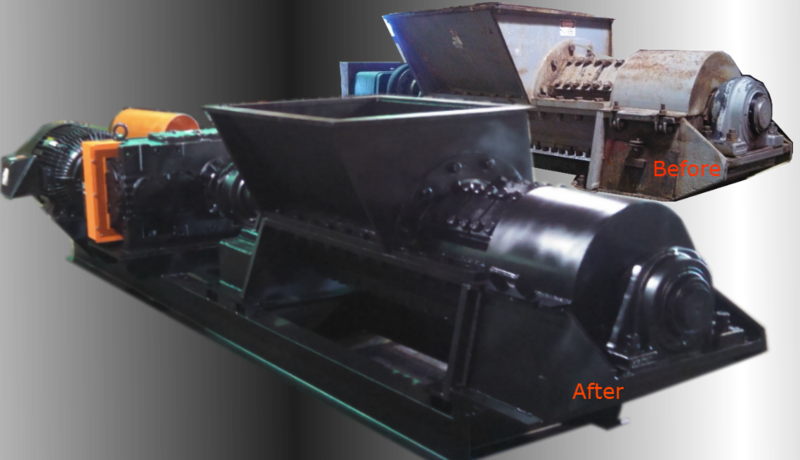 Industrial Hardfacing is a Market Leader designing, manufacturing, and repairing equipment for the Rendering, Oil Seed, Pet Food, Meat Processing and Recycling Industries.